Two days ago Major League Baseball hosted its annual All-Star Game, this year’s edition played at Citi Field in Flushing, home of the New York Mets. As a Long Island native, the big question was whether you were a Mets fan or a Yankees fan. For sure, there were plenty of both, though I found myself somewhat caught between the two worlds. Many of my closest friends and their families were Yankees fans (one even had the Yankees logo in their living room carpet and a seat from the original Yankees stadium literally enshrined behind glass in their entertainment room). On the other hand, the first baseball game I ever attended (and the next few that followed) was the Mets at their old Shea Stadium. One of my childhood memories from those Mets games at Shea was the pretzels. Mind you, not the pretzels they sold in the stadium. These were large, soft, still-hot pretzels sold from wire-frame-shopping-cart vendors waiting outside the stadium. That may sound crazy to some of you, but those were some of the best darned pretzels you could get. These days it’s been a good long while since I’ve had a genuine, hot, soft pretzel. At least seven years, probably longer. What better time to unveil our gluten-free version than MLB All-Star week? One bite of these brought me right back to my childhood, and I’m willing to bet these pretzels will please your palate, too. 1. Combine the water, sugar, and yeast in a bowl and let sit for five minutes, until the yeast is activated and bubbly. 2. Add the melted butter and egg yolks, and whisk to combine. 3. In a separate bowl, whisk together the flour, salt, and xanthan gum. 4. Add the liquids to the dry, and stir to form a slightly sticky dough. 7. Roll each piece into a smooth snake about 18 inches long. 8. Form the snake into a big upside-down letter “U.” Cross the tails twice, then flip the loop down over the tails. 9. Place the pretzels on the prepared baking sheets and set in a warm location to let rise for about 1 hour. 10. Toward the end of the rise, preheat your oven to 400 deg F. Combine the water and sodium carbonate in a wide saucepot and bring to a boil. 11. Par-bake the pretzels for 4 minutes, then remove from the oven. 13. Boil the pretzels for 45 seconds per side (1:30 total) in batches as the size of your pot allows. 14. Return the boiled pretzels to the baking sheets. 15. Use a pastry brush to brush the pretzels with the egg wash and sprinkle with the Kosher salt. 16. Bake for an additional 18 minutes, rotating the pans halfway through the bake time to ensure even browning. 1. The secret to truly great soft pretzels that have their characteristic taste and signature browning is the use of food-grade lye in the water during the boil. Lye is seriously caustic stuff—it’s used in drain cleaner and you need to handle it with gloves and eye protection. It’s also something we can guarantee 99.9% of home cooks don’t have in their pantry. What makes lye so great is that it’s a strong alkali. Well, there is a weak alkali that pretty much everyone has in their pantry: baking soda, also known as sodium bicarbonate. But because it’s significantly weaker than lye, it doesn’t do nearly as good a job at making pretzels (though it’s a decent stand in). You can boost its properties, however, with this simple “trick.” Take 1 cup of baking soda, spread it out in a thin layer on a baking sheet, and bake it in a 300 deg F oven for one hour. Through a little magic, your sodium bicarbonate will become sodium carbonate, a stronger alkali that’ll make better pretzels. 1 cup of baking soda weighs about 250 g, and after baking to convert it to sodium carbonate, you’ll have about 160 g.
2. 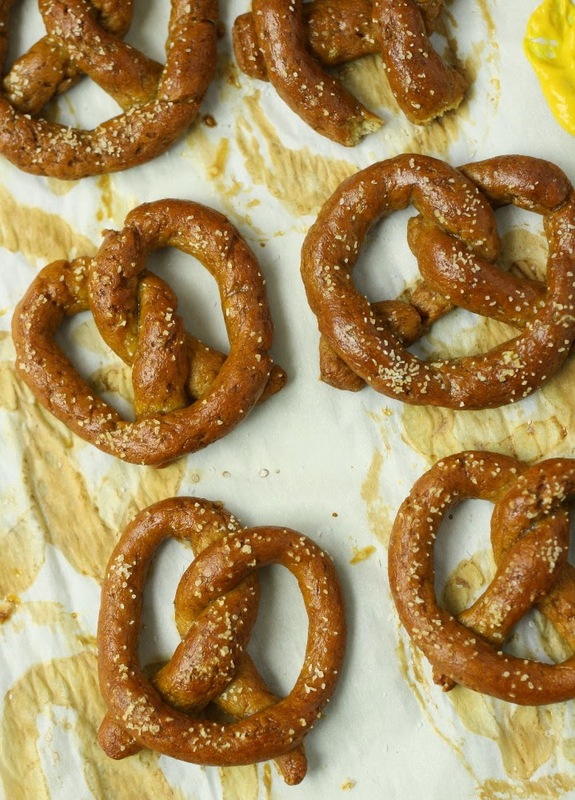 Authentic pretzel recipes don’t use any eggs. In this recipe, we give you the option. 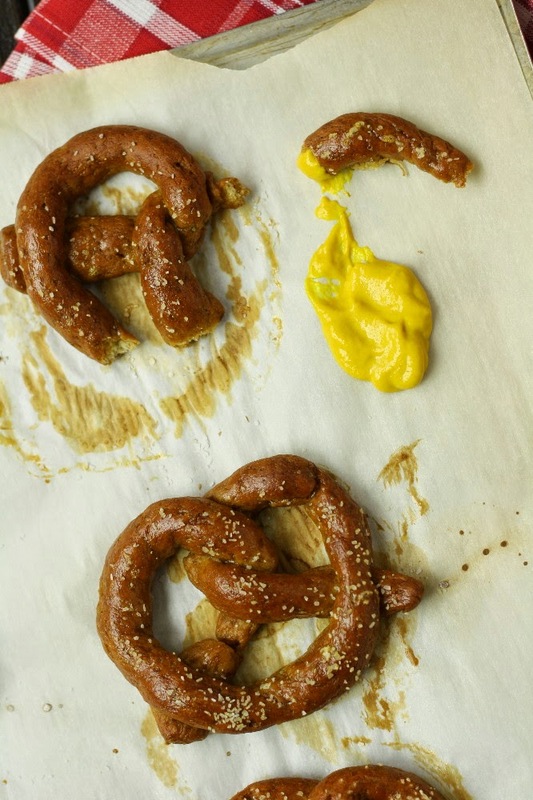 The dough is easier to work with without adding the eggs, but we think the texture of the finished pretzel is better when including the egg yolks called for in the recipe. This recipe is: gluten/wheat-free, peanut-free, tree-nut-free, fish-free, shellfish-free, soy-free, vegetarian. This recipe can easily be made egg-free by omitting the egg yolks and wash. It can easily be made dairy/lactose/casein-free by substituting Spectrum vegan shortening or similar for the butter. You two amaze me with your generous work to help the GF world enjoy quality food – and in the heat of summer, too. Thanks so much! I’m trying these as soon as we get back down in the 70’s. I’m so excited about these! I’m in the midst of my 4th pregnancy and have been craving soft pretzels (I inevitably crave something non-celiac friendly when pregnant). Every recipe I’ve tried has been a disappointment. However, nothing I’ve tried from your blog has disappointed yet, and I’m anticipating the same satisfaction from these pretzels! OMG! I was wishing I could have a pretzel the other day at our county fair! NOW I CAN! Thanks SHirley at GFE–I would never have found this without your post! These are amazing! We couldn’t stop eating them. Thank you! These look great and the trick with baking the baking soda is something I never thought of. I also noted that you parbake your pretzels before boiling. I was always taught to boil them after rising then to bake with no parbaking. Would this work with this recipe? Or is it necessary to parbake because of it being gluten free? Thank you for the great recipe. Grandmashadowcat – Thank you so much for your kind words. We hope enjoy them when you try them! Skirley – Thank you so much for sharing the recipe!! Amber – I can empathize with the pregnancy cravings as we are in our third right now. 🙂 We appreciate the compliment and hope you enjoy these as mush as we did. They taste just like the real deal from our memories. Kathy – Yeah! We are so glad you enjoyed the pretzels. We found the same problem with having them in the house. DKinney – Traditional pretzels are not parbaked, however, to create the right texture for GF dough, the dough is much wetter than a traditional dough and it cannot stand up to boiling straight after the rise. The parbake is a critical step in the processes. I got home from my run this morning and my fiance had eaten the whole container of pretzels… He’s not GF and usually very picky with my flavor and textures… these passed his test! Perfect recipe ! Just made a batch and this is by far the best GF soft pretzel! I used food grade lye to dip the pretzels and they cooked wonderfully! Now we are eating them with Omission GF Lager beer, the tastiest Gf beer, a perfect combination for oktoberfest season, thank you fr this special recipe. I have always been one who LOVES food, and one of my favorite foods is soft pretzels. One of the things I miss most since being gluten free is soft pretzels. I love experimenting with recipes, making up some of my own, and tweeking already made recipes. I decided I was going to figure out how to make gluten free soft pretzels if it killed me! I did lots of research on different gluten free flours, and came up with a hypothetical flour blend, and then thought maybe I should check the internet before I give it a go. I did it mainly because I didn’t want to fail miserably and waste expensive flour if there was even a semi good recipe that I could play around with. I sifted through probably 8 or 10 recipes, and stumbled upon this one. It looked like Pete and Kelli really knew what they were talking about. And, the biggest thing for me, they seemed to remember what a soft pretzel tastes like. That is hard to find in the gluten free world. So many people say “it tastes just like the real thing!” and it tastes nothing like it! So I gave it a go, and it came out better than I ever could have expected! I tweek new recipes, because, up until now, I had never found a perfect one. I can honestly say, no tweeking needs to be done! It’s a perfect recipe. Next time, I’m going to see if I can make pretzel buns. Pete and Kelli, you have made me a happy woman. Thank you for all your hard work! I can’t WAIT to try your bagel recipe!